If you have a lot of books, don't let them collect dust. From a hide-a-way book box to a fashionable clutch, check out a few DIY projects that use your old books. This is the perfect box to hide your clutter in. It not only looks great but it is functional, too. Books that look like you may have read them, that you don't mind cutting in half. Books side by side should measure the width of the wooden box. 1. You can paint the box if you wish but you're the only one who should see it. Cut books down with Dremel or saw so that no more than 1 1/2" from the spine shows, leaving two books undone. 2. The 2 books that you left undone are your edges. Cut one book halfway down beginning with the front, leaving one cover uncut. And cut one book down beginning with the back, leaving one cover uncut. 3. Using hot glue, glue covers together. Clamp closed; allow 24 hours to dry. 4. Open outside book covers and screw flathead screws into the side of the box. 5. Place on shelf and use to keep small items hidden. This purse will keep everyone guessing! 1. Carefully cut the banded pages out of the hard cover and set aside. 2. Starting with the top center of the book, hot glue cording or decorative ribbon along all four edges of the book. Use the wooden skewer to apply pressure creating a good seal. 3. Lay fabric down (Lay with back or undecorated side of fabric lying face up.). Lay open book on top of fabric and use pen to trace the outline of the book onto the fabric. Trim the fabric 1/4" to 1/2" smaller than your outline. Put aside for now. 4. Keeping the zipper closed choose your zipper placement. Begin by gluing the bunny ears closest to the zipper pull onto the spine of the book. Next hot glue one side of the zipper to the inside of the book. (If you used cording, start just inside of the cording leaving enough room for zipper to unzip.) Open zipper to glue the other side of the zipper down. Glue the zipper ends to the spine. Leave the end of the zipper for last. 5. Grab the fabric you cut and trim if needed. Hot glue to the inside of the book. Allow time for glue to cool. 6. Add any additional embellishments that you would like with hot glue. I added a mirror with trim. Turn a basic floor lamp into a one-of-a-kind table lamp with these easy DIY tips. Books you don't mind drilling a hole into. 1. 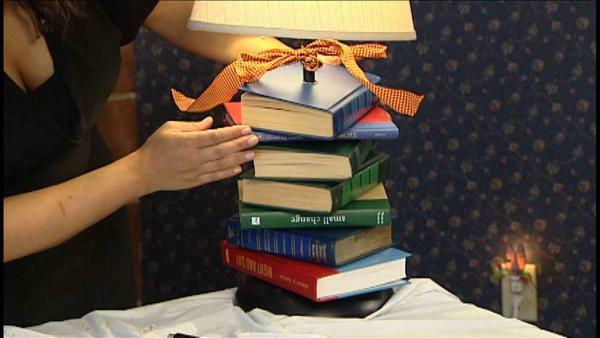 Dismantle your lamp only as far as you need to thread books on the lamp column. Remember the order and what goes where by using your cell phone camera to document how you took your lamp apart. Make sure to note the diameter of the lamp column, this is the size Forstner drill bit you'll need. 2. Stack the books to see if you're happy with them aesthetically. Clamp each book down, one at a time. Mark the center with an X. Make sure to put the thick piece of wood between your book and the table. Begin using the drill to bore holes completely through the center of the books. Set them aside. 3. Thread electrical wire through holes in books and slide books over lamp column until the first rests on the base and all other books afterwards. 4. Working backwards, begin to reassemble the lamp. You can use the same shade or opt for a new one by using a shade that fits directly onto the lamp base. 5. Tie Ribbon onto column to hide your drill marks. Use hot glue to make more permanent. Caution: This lamp is heavy. For more information on Elizabeth Martinez-Faz visit www.CraftyHouston.com.